Boxers are medium-sized dogs. A male German boxer stands from 26 to 28 inches, weighing 65 to 90 pounds, while a female German boxer reaches anywhere from 24 to 26 inches and weighs 60 to 85 pounds. American boxers are slightly smaller, the males 23 to 25 inches tall and the females averaging at 21.5 to 23.5 inches. Both breeds have either fawn or brindle coats. 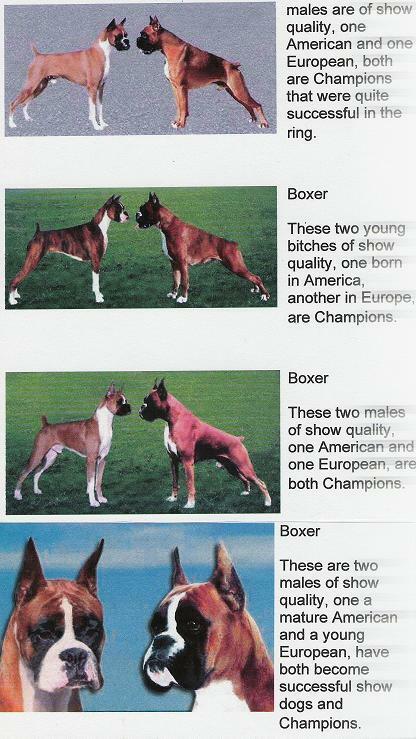 Boxers with white markings on their coats are considered flashy, but an excessive amount--more than a third of the coat--leads to disqualification from dog show registries. The lower jaw is slightly heavier than the upper jaw and protrudes slightly. They have broad chests and wide skulls. , in order to bite firmly and hold on tightly. A Bullenbeisser which had these characteristics was best suited to this job and was used for breeding. Previously only the ability to work and utilization were considered. Selective breeding was carried out which produced a dog with a wide muzzle and an upturned nose. dark or black stripes running parallel to ribs. Stripes must contrast distinctly to ground colour. White markings should not be discarded. They can be quite pleasant.